Edraw offers you a number of ready-made PowerPoint competitive analysis templates which you can reuse and free. Edraw is the ideal competitive chart maker giving the best convenience to make competitive analysis diagrams. It contains highly-customizable competitive analysis templates that make it easy for anyone to build personalized and professional-looking competitive analysis for MS PowerPoint. There are several ready-made competitive analysis templates available, you can visit competitive analysis templates to view and download the templates. All templates can freely change color, theme and effect. After finish editing, the chart can be exported to PPT format with a simple click. Edraw pre-designed competitive analysis templates and examples will help create your presentation quicker. They are the professionally designed templates that you can use in your work. You may like Competitive Analysis Templates for Word. 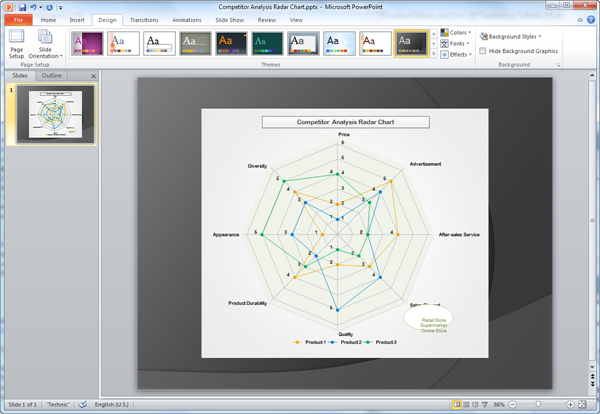 Download Edraw to Create More Competitive Analysis Templates for PowerPoint. Try Edraw Max FREE.